This week's Artist Spotlight is going to take things in a different direction than usual, as we're not technically going to be looking at the work of a human artist. If you've spent any time at all on Facebook, Instagram, or any other social network in the last few days, you'll have noticed a proliferation of fantastical and bizarre psychedelic images, often tagged with the hashtag #deepdream or something similar. For those of you who haven't seen, check out the example attached to this post to get a sense of the kind of image we're talking about. Rather than simply being the acid dreams of artists looking to reconnect with the 1960's hippie vibe, these pictures are actually the result of a feedback loop created using Google's image recognition algorithms. Part of a larger ongoing project at Google to develop image recognition technology by identifying various objects within photographs, interesting results begin to occur, as the software often believes it has found patterns where none exist - arguably, an intrinsic element to many of the world's artistic movements. "The techniques presented here help us understand and visualize how neural networks are able to carry out difficult classification tasks, improve network architecture, and check what the network has learned during training." "It also makes us wonder whether neural networks could become a tool for artists—a new way to remix visual concepts—or perhaps even shed a little light on the roots of the creative process in general." We're not going to argue about whether or not an artificial intelligence (some would say it's just an algorithm, but it's hard to nail down exactly what the difference is between the two) can really be an artist, but like all good artists, the 'whatever you choose to call it' presents the world with difficult questions. Regardless of whether you appreciate or enjoy the images that are produced, it's a remarkable exploration of interpretation and subtlety, and for those of you who may have explored dreams in your artwork, surprisingly resonant. 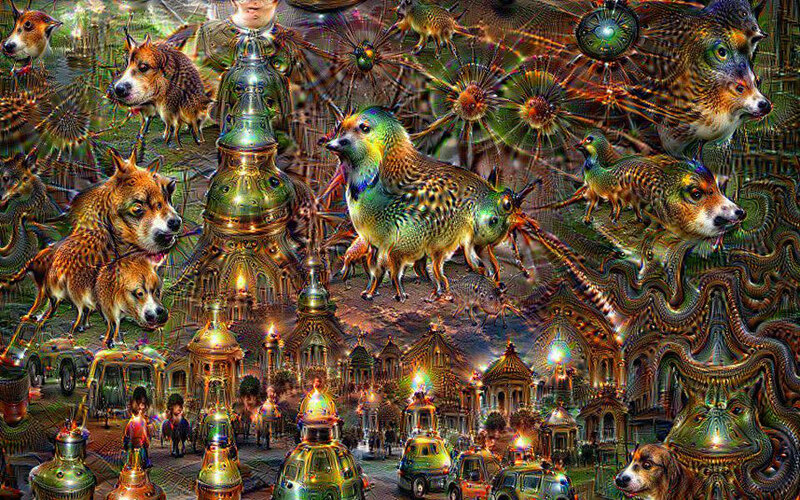 If you're interested in exploring the Deep Dream interface, a number of websites have sprung up that offer you the ability to upload your own images to have them processed by the feedback loop. For those who are more technically savvy (and perhaps less comfortable with uploading their images to random websites on the internet, which is probably a smart decision), it's possible to download and compile the code yourself, which is an odyssey in and of itself.